"I could do so much more. SO MUCH MORE! But this is what I get. My reward, and it's NOT FAIR! Oh, lived too long." 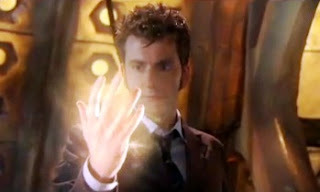 The Tenth Doctor contemplates his imminent regeneration. As I write these words, we are fast approaching the end of yet another year. For some of you the time has already come and for others, the moment has already passed. The old year has no doubt been eventful... or maybe it hasn't. A good year; a bad year; An awful year; A dull year; A wonderful year. Whatever our personal circumstances may be, we find ourselves at this common point... the old world of 2010 is dying and we are on the cusp of venturing forth into a new one. To be sure, pretty much all of us could have done more with the year gone by... but that deal is done. The old is passing... the new is coming. Like the Doctor in the haunting track "Vale Decem", we find ourselves facing the truth... however uncomfortable or comforting.... it is time to start again... time to regenerate. We may have become accustomed to the form we have taken over the past 12 months and perhaps the trepidation of shaking of that manifestation outweighs our anxiousness to embrace what may or may not come to pass along the road to the future. Or perhaps for some of you it's a matter of being trapped in that form and yearning for release into a new you, a better destiny. Everything we experience personally in life be it for good or ill... has the capacity to teach us and shape us into better individuals. The same truth applies to society (with the things we experience collectively). New Year's Eve is a time to contemplate what has been - both the joys and the sorrows, and glean what wisdom we can from our exploits (or lack of). However... there is a problem. We as human beings become very accustomed to familiar patterns. Animals have migration patterns - they tread the same trails, thermals and/or currents... generation after generation. As an intellectual and/or spiritual species, are we not guilty of the same love of routine? Animals follow their patterns for practical reasons... but do we do the same? Or is it just habit? I recently went to watch Voyage of the Dawntreader at the cinema with one of my friends. It was a good film... but I was seriously disappointed at how one of my favourite scenes from the entire book saga was downplayed. It's the crucial scene where Eustace Scrubb - victim of an enchantment that rendered him in the form of a dragon... is released from his scaled prison and restored to boyhood. It is an absolutely crucial scene because it marks the final transformation of Eustace from a spoiled and horrid brat, into a considerate and well-meaning person. Of course his circumstances had humbled him and he had evolved to a point where he treated others with more kindness... but he still needed to be released from his monstrous visage; after all, he could hardly go back to WWII era England looking like a giant lizard (although i suppose he could have proved useful in the war effort). The book makes it absolutely clear that Eustace could not free himself. He rips himself raw at Aslan's command... and yet still the dragon remains. The call to 2011 is upon us and as we try and rip away our habits and hang ups, still the vestiges of our dragonly clothing desperately cling to us. How many weeks will we last before a resolution is broken and we fall back? Six weeks? Two? A day? An hour? We find ourselves in the same pickle as Eustace. Aslan drew nearer to Eustace and made him understand that in order to be free of his past, he needed to allow the lion to rip the dragon out from deep within. For the dragon was with Eustace well before he took its form. Aslan's power tore the scales from Eustace and after bathing in water, the beast was gone and the boy had returned. It is of course a picture of repentance and baptism. 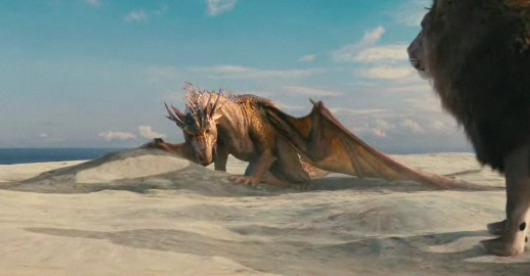 The Dragon Eustace, before Aslan. So how can we escape our dragons? The answer is clear... we need to surrender to the tender voice of God and allow him to rob us and robe us. We must be robbed of our conformity to old patterns... and robed in the way of new life. "It is a far, far better thing that I do, than I have ever done; it is a far, far better rest that I go to than I have ever known"
"Therefore, if anyone is in Christ, the new creation has come: The old has gone, the new is here! All this is from God, who reconciled us to himself through Christ and gave us the ministry of reconciliation: that God was reconciling the world to himself in Christ, not counting people’s sins against them. And he has committed to us the message of reconciliation." As we let go of '10, let us embrace '11 together in a spirit of new hope and new adventure (whatever the critics may say. Nicely done Nick, a good end thought for the year! God bless you for 2011 and all it brings, with the companionship of God in all things. Happy New Year old chap!